25th August 2012 - Reports coming in of some very good sea trout fishing over the past week. Aidan Beirne fished for a few hours today and caught and released 4 fish, 3 of which were over 1 pound - he also rose numerous other fish. Three other anglers reported similar numbers of fish for the past few days and the average weight of sea trout is over 1 pound which is a marked improvement on previous years. 17th July 2012 - Good fishing reported on the Glenisland Co-op side of lough Beltra last week. Ronnie Mayock landed a fine 11 pound salmon at Morrissons on Monday last and on Tuesday Co-op member Justin Predergast from Dublin landed his first ever salmon on the fly, a 7 pound bar of silver at the boathouse - well done Justin hopefully the first of many. Conor Deffley had four grilse recently and Malcolm Killian had three. Salmon anglers on the lake reported meeting lots of sea trout. Prospects look good for the coming weeks. 13th May 2012 - Frank Dooley had a 9 pound salmon this morning on his first cast! After all the rods blanking yesterday it didn't take long for Frank to get off the mark today. 12th May 2012 - Unfortunately we had no fish during our competition today. We did however have lots of prize winners! Details will be posted over the next few days. Thanks to everyone who turned up to support the club. 7th May 2012 - Reminder to all of our members that our annual competition takes place this Saturday 12th May. 6th May 2012 - Jackie Deffley caught a 9 pound salmon at Walshes point today. A visiting angler also returned a very large salmon after playing it for 40 minutes - estimated at 14 pounds plus. 1st May 2012 - Committee member David Edis will shortly be setting up a fly tying club in conjunction with the Co-op. If you would like more information or would like to order flies please contact David on 087-7533356. Please note that all proceeds are very generously donated to the Co-op. 2012 Competition - This years fly fishing competition on lough Beltra will be held on Saturday 12th May. Glenisland Co-op would appreciate the support of all anglers and an application form can be downloaded here. The Co-op would like to thank all of our sponsors for their generous support - Rockys bar, Kevin Beirne Auctioneers, Dolans Joinery and Oliver Corcoran Plant Hire. 1) You must notify the secretary before Friday 11th May if you wish to take part as there is a limit to the number who can fish the lake at any one time. Please contact Michael Cunningham on 087 7620245 or email here to register. 2) Fishing times are from 10am to 3pm or 4pm to 9pm. Please select whether you want to fish morning or evening. Boats must be on the shore at 3pm and 9pm. 3) A barbeque and refreshments will be provided for all anglers at the new boathouse between 3pm and 4pm. Refreshments kindly sponsored by Taylor Architects, Castlebar. 4) Weigh-in and prize giving will be at 10pm sharp in Rockys bar, Linenhall street, Castlebar. All fish to be handed in before weigh-in commences. 5) Fly fishing only, maximum 3 salmon per angler. 6) Entry fee of �?0 for Co-op members. All entrants must be paid up members of the Co-op. Excellent prizes. 7) Each entrant will fish at their own risk and must wear a life jacket. 8) Anglers must have a current salmon licence. 23rd April 2012 - Ben Baynes managed to land yet another salmon this evening. The 7 pound fish was taken at the quarry on a Beltra badger. 19th April 2012 - Ben Baynes landed another two salmon this evening at Morrisons and the boathouse. 15th April 2012 - Ben Baynes had an 8 pound sea liced fish at the boathouse today and rose four more salmon this evening. 14th April 2012 - Michael Dolan landed a 10 pound salmon at the buoy today. There is a good run of fish into the lake this past few days. 13th April 2012 - Rocky Moran has had some great fishing over the past week. Rocky managed to land four salmon over the course of the week - three fish weighing 10 pounds and one fish weighing 12 pound. 4th April 2012 - Eamon Kennedy had his first fish off Beltra this evening. The fish was estimated at 6 pound and was taken off Morrisons. 3rd April 2012 - Ben Baynes caught a very fresh 7.5 pound salmon at Morrisons today on a size 6 Hairy Mary. 1st April 2012 - Just a couple of reminders to all members - please remember to run your engine through our recently installed tanks at the lakeshore. Also all fish caught on the lake must be reported to the co-op at the end of each day. 31st March 2012 - There has been very little activity on the lake for the past week due to the bad conditions - for fishing anyway! We need rain to get more fresh fish into the system. 26th March 2012 - Johnathan Murray landed three fresh salmon on the lake over the weekend. All three fish were estimated to be over 10 pound. 21st March 2012 - Ben Baynes landed a fresh 8 pound fish today at Fahys point and there was also a 12 pound fish taken on the Newport river. 20th March 2012 - There was a big turn out on the lake for the opening day and Vincent Rigney landed the first salmon of the season estimated at 6 pound. We also had reports of two more fish lost on the day so overall not a bad start to the season. Our Secratary Michael Cunningham will be in touch with the winners shortly. Many thanks to everyone who has paid membership. Please note that there are only 3 boats left for the opening day on March 20th. Anyone wishing to book a boat please contact Michael Cunningham on 087-7620245. Aidan Beirne presents Eamon Kennedy with the trophy for heaviest fish for 2011. 25th February 2012 - Thanks to everyone who attended our AGM last night. Eamon Kennedy was presented with the cup for heaviest fish of 2011 - well done Eamon. Season opens on Tuesday March 20th and annual memberships are now open for application. Please click here for more details. 11th February 2012 - Welcome to all of our new members and many thanks to all who have forwarded on membership. Remember to be in for our free draw you must have paid your membership by our AGM on the 24th February. 4th February 2012 - All members should have received our AGM notice and membership application in the post. Please note we are having a free draw for all paid up members at the AGM. Prizes include fishing at Delphi for 2 people, a day on the Ridge Pool and 2 rods on the Galway weir. 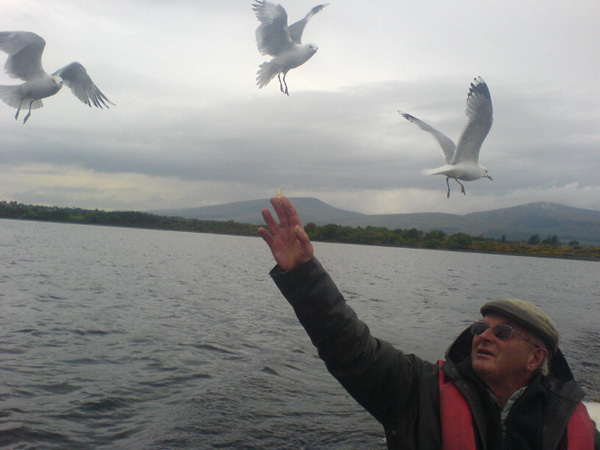 2nd February 2012 - The 2012 fishing season will commence on Lough Beltra on Tuesday 20th March. Applications for membership to the Glenisland_Co-op are now being taken. If you would like to fish the West side of Beltra then please contact Newport House. 6th January 2012 - It is with profound sadness and regret that we advise of the sad passing of James O'Hora - Co-op member, friend and ghillie on Beltra for over 60 years. A guard of honour is being organised at his funeral and it would be nice to have a large turnout. Funeral tomorrow and Sunday - Ar dheis Dé go raibh a anam.